Sometime ago, Chuck Swindoll sat down with Dr. Mark Young, president of Denver Seminary. Mark served as professor of World Missions and Intercultural Studies at Dallas Theological Seminary, and was senior executive pastor for Missions at Stonebriar Community Church in Frisco, Texas, before accepting his role at Denver Seminary. 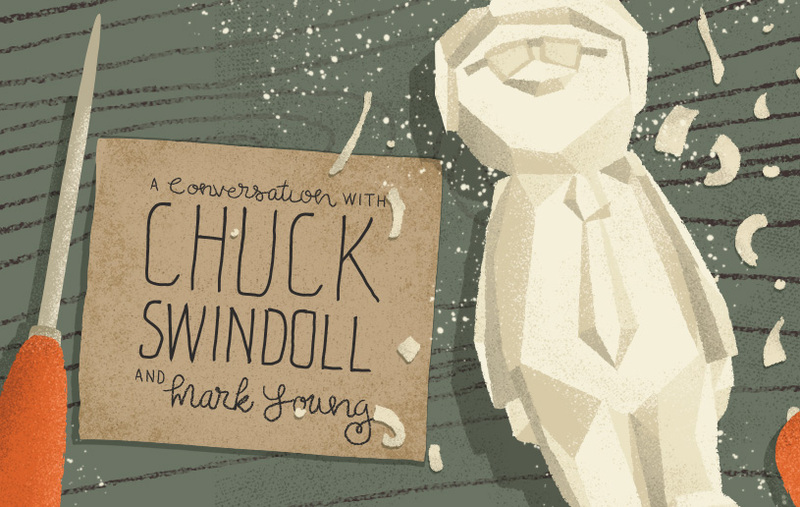 In this conversation, the two longtime friends discussed the timeless treasure of the Bible and Chuck’s growth as a preacher throughout the years. Mark Young: When do you remember preaching your first sermon? Chuck Swindoll: When Cynthia and I were dating. I was leading music for a little evangelistic team, and she played piano. On one occasion, one of the preachers didn’t feel well, and I preached in his place…on the prodigal son. Mark: So, when did you first begin to think, I love this! about preaching? Chuck: I was serving as a Marine on Okinawa and doing street evangelism with Bob Newkirk, my Navigator mentor, as both of us stood on the back of a flatbed truck. People know me today only as a preacher, but back then, I was a Marine. I was doing ministry with the Navigators, which is mainly a one-on-one ministry, so at that time I never saw myself as a preacher. I had been helping with the singing until one day Bob gave me the opportunity to preach—and I had a delightful time. Earlier, I had asked Bob, “You’re gonna have me do this? I could never preach.” And he said to me (I’ll never forget it), “You’re a natural.” Afterward, I thought, I could do this. Chuck: No pastor in any church I previously attended was like Bob. They were always buttoned up tight, and I never heard a story of something that they had done wrong. Such authenticity was never modelled. Though an Okinawan street ministry sparked Chuck’s desire to preach in his winsome, candid style, his ability to speak publically didn’t come easily. A high school teacher helped Chuck to speak with the clarity and passion we instantly recognize today. Mark: Chuck, I’ve heard you talk about a speech problem you had earlier in life. Was that part of your hesitance to become a preacher? Chuck: So that summer I went through speech therapy with that man. Isn’t that great? Mark: That almost makes me tear up. Chuck: I have him to thank for teaching me how to speak. He said to me, “Your mind is running ahead of your mouth.” I have the opposite problem today. But, seriously…I love words. I’ve become a word vulture. Mark: I know you are. Chuck: And I love books! I’ll pause over a phrase and read it again and again. I love great words. Chuck has a great love not just for words but an even greater love for the Word. This reverence and fidelity to God’s Word influences his dedication to cultivating biblical knowledge through his preaching ministry. Mark: Do you think that the expectations of congregations have changed through the years? Chuck: Of course. Over my 50-plus years in ministry, things have changed, just as styles have changed…but some things don’t: God’s Word stays the same; it abides forever. Mark: How do you earn a hearing in today’s climate? Chuck: You respect the audience. No one learns well when they’re insulted or made to feel foolish or uneasy. Now, I don’t tiptoe around and try to shape everything according to what everybody would want to hear. I don’t do that. Mark: I think that’s an absolute key, because you can’t assume that people come knowing what the Bible says or believing that it makes any difference in their lives. Chuck: That’s correct. Who am I to stand there in front of a large group of people, without being interrupted, and expect to keep their attention for 30 or 40 minutes without keeping it interesting? Chuck: People today are not automatically interested. Mark: Right. You know, one of the ways we reach contemporary culture comes from a willingness to connect with people personally—since the Bible itself doesn’t have authority in the minds of many people and since the office of the pastor doesn’t have the same authority. Mark: You care and you’re authentic. That conversational style of preaching that you have…that’s who you are. Mark: And it actually is so powerful, Chuck. Chuck: When I gave myself permission to go there, it was liberating. When I preach, I’m not doing a performance. In the final part of the conversation, Chuck talks about preaching as a gift, a calling—and a ministry. To shepherd in the way that Jesus modelled, Chuck continues to prioritize people, even after he speaks the last words of his sermon. Whether preaching to a packed house or a small gathering, his focus is on ensuring that the Bible is taught in an accurate and caring way. Mark: You preach two services every Sunday morning. After the second message, how do you feel? Chuck: I’m exhausted, and yet, I make myself available because I’m a pastor. I’m not a guest preacher or a lecturer. I walk down front, and I stay there, often until the last person leaves. Chuck: I really want to be there. I may be exhausted, but I still take time to be with others, because I believe it ministers to people. Mark: Do you think there’s a difference in the dynamic between preacher and audience when preaching to a smaller group? Chuck: Oh, I think there is. But it’s still God’s Word, and truth is still truth, whether you’re talking to two inmates in a cell or you’re talking to a church congregation of thousands. Mark: Now let’s take a moment and think about the pastors who are weary, and they’re wondering, Is God working through preaching? What’s your word to them? Every time anyone delivers God’s Word, it’s like tossing a log on a frozen lake. Finally, warmer days arrive, the thaw comes…and it sinks in.